Grateful Blog: Day 99: 99 Days of the Grateful Blog…wow…I’m STILL Amazed at this point that I’ve made it this far and that I’m still at it. But the thing is I’m leaving. Not forever, but for a while. It’s true I COULD use a break but I’ve been so touched and amazed by the daily responses I get that I come back each and every day and find inspiration in the act of being Grateful. It’s made me more aware of ALL the blessings in my life and that WAS the point. To celebrate all the things and people that we’re Grateful for. But my life is busy and complicated. I regularly work 50-60 hour weeks. It’s hard to squeeze in sometimes when you’re just getting home from work at 9pm and then reach into your life or your day and find that inspiration. One of my great inspirations, from 30 years ago now, is the American intermountain West. That great expanse west of the Rockies and east of the wet coastal mountain ranges. What they call ‘Basin and Range’ country of the Great Basin. Out there in the sagebrush sea: Wild horses, antelope, coyotes, tumbleweeds, small towns, cowboys and big, open blue skies with the horizon as far as the eye can see. That’s the country that inspires me the most. I can’t explain and I won’t attempt to try. The truck is packed, a sleeping bag, some wood, water, extra gas and spare shovel. Like I said, it’s big country and it’s remote as hell. Look on a map of Oregonwhere it meets Nevada and Idaho. See that blank spot on the map? 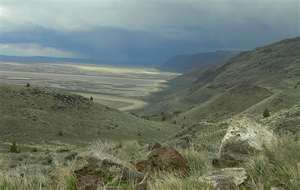 Down near Steens Mountain and the Alvord desert? Yeah, that’s the place. Then on through the Owyhee Country and up through Pendleton (time to finally make good on a new custom made cowboy hat). That’s as much of a ‘plan’ as I need to know. There’s also a few old favoritehot springsI need to visit and soak for a few days. You know, warm up from a long winter and loosen the bones up from sleeping on the ground with no tent, just me and the stars and the coyotes. My old truck knows the dirt roads at least as good as I do and frankly, half the joy is not knowing what comes next, but it’s good a spare 5 gallons of extra gas just the same. So if I can somehow figure out how to do ‘The Grateful Blog’ from my phone and I actually get some service, which is next to nothing out there, I’ll take a stab at it. If not, well I’ll be back, scruffy, wide-eyed, and smelling of sagebrush fires, cigars and whiskey. I’ve got my Martin guitar, a few old favorite books I’ve been meaning to re-read (there ain’t no stinkin’ ‘E-Books’ in the desert man!) and a 12 gauge shotgun just to keep the rattlesnakes honest. It’s THAT sort of country after-all. And it’s my favorite kind of country. Time to get back there and make sure thehot springsand I survived another long winter. Somewhere about 450 miles and 9 hours from here tonight, I’ll be Grateful to know that in both cases it’s true. See you down the trail!